Sleeping in a train can be quite a bore, and uncomfortable, and annoying, and cold. Cold, it sure was with all of that damned air-conditioning going on all night, but otherwise our stay on the Amtrak train was almost not as horrible as it sounds. The biggest difference between American and European trains is the size of the seats. Americans tend, as you probably know, to be much larger than the rest of the universe. As a result, seats are also much larger which makes it way easier to sleep. It still isn’t the best thing in the world but it made for an almost decent night. 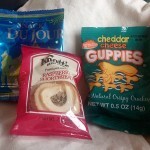 Amtrak kept the peace during the delay by feeding us these snacks. 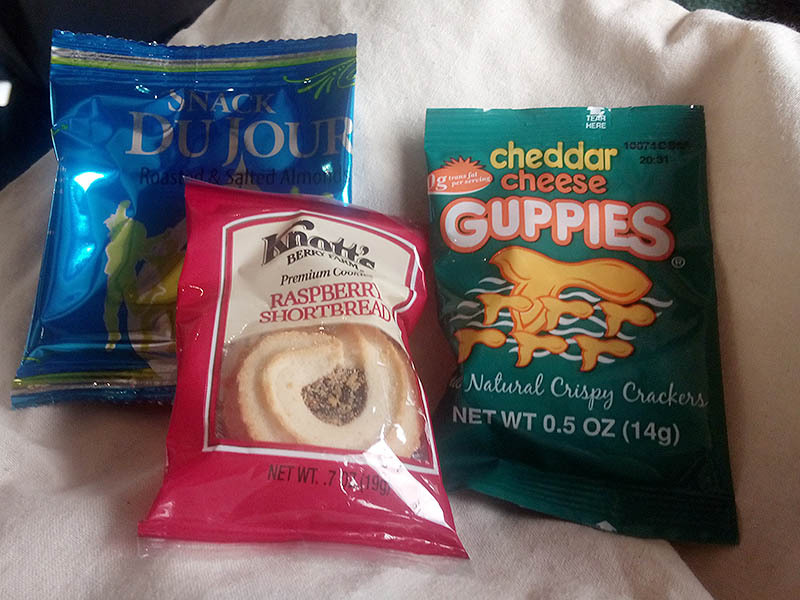 We even got some little snacks in order for us to forget our rage at being delayed. The snacks were not so impressive but Linnea liked them because they featured some cheese-crackers shaped like fish. There also were some roasted almonds and a tiny raspberry shortbread cookie that promptly disappeared in my belly. Anyway, we endured this strange strange night decently enough and left the train in Erie, P.A., where Linnea’s mum was supposed to pick us up at some point. 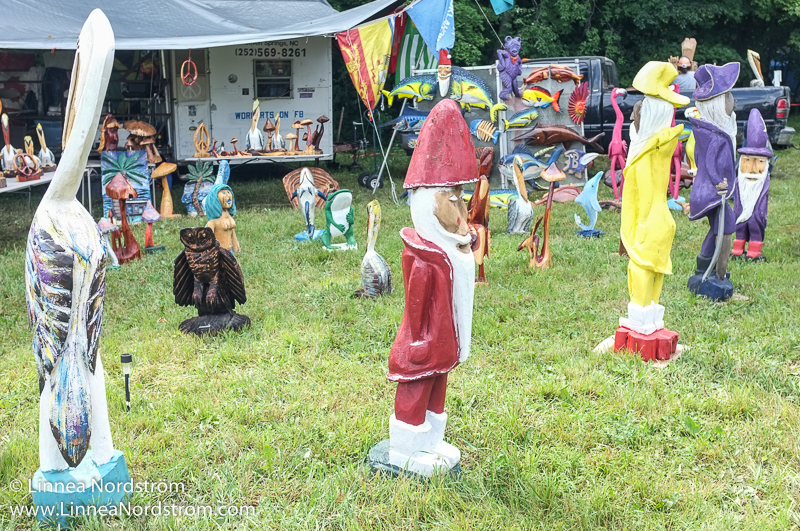 Once there, we met a fellow Scandinavian: Norwegian Björn who was set to attend the Great Blue Heron Festival just like us and was waiting for Maggie as well. We did wait a little bit, chit-chatting with Björn, a rather easy-going guy who has been coming to the U.S. regularly since he went there as an exchange High-School student back in the late Seventies. After a while, Maggie did arrive and was nice enough to take us all out for breakfast. Finally, I would have the possibility to eat out at a real American diner, with waitresses and stuff! Neat! Zodiac Café is some kind of an institution in Erie and they have LOTS of food on store. After a little procrastination I ended up ordering the Pancake/Bacon/Muffin menu, served with a big glass of milk and, oddly enough, deep-fried onion-rings. This brunchy kind-of thingy proved to be as tasty as it was dangerous. After finishing the first pancake (out of three), the two pieces of bacon, the toast, the muffin and half a dozen onion rings my belly started aching as if it were connected to the gates of hell. Still I managed to win this fight, barely, but still standing. I knew that from now on that American food portions might be a problem during this trip. 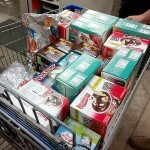 We purchased enough ice cream to keep the hippies happy for the weekend. After this true U.S. Food Experience™ Maggie drove us to a Huge warehouse in order to make some bulk purchases for the Great Blue Heron music festival, our next stop, where we would be volunteering. The store, called Sam’s club was everything you’d imagine an American store to be: Freaking Damn Huge! 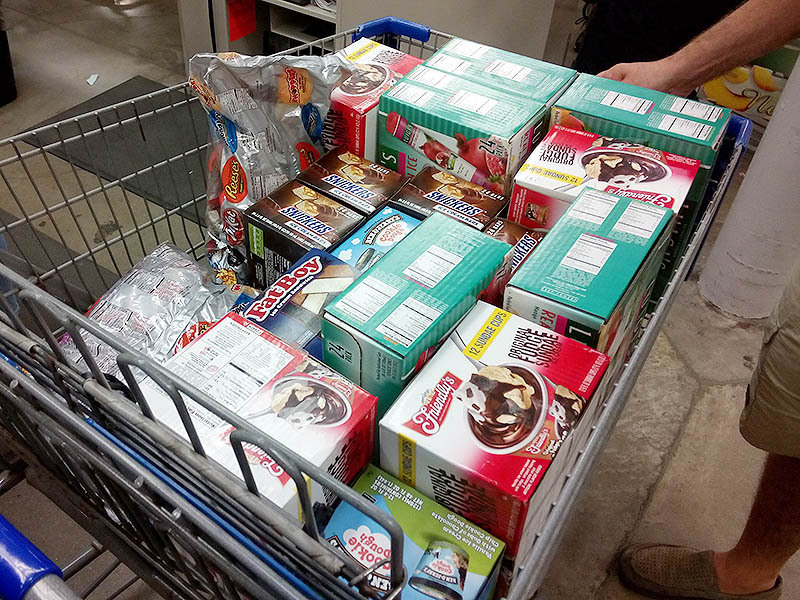 Boxes of ice-cream weighting kilos, Nutella pots too big to carry with one hand, candy, candy, candy everywhere! Björn was most impressed by the place and ended up getting half a dozen boxes of frozen Snickers bars. Besides the candy, we also purchased a cash register that would be used, just like the candy, for the festival. When all of this all-American business was done, Maggie drove us straight to upstate New-York to the actual grounds of the festival. The G.B.H (as it is often shortened) is one of Linnea’s favorite events of all time. She’s been attending since forever and was dying to show me that this weird Hippie/Bluegrass event could conquer my heart. 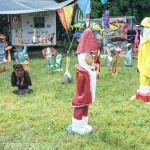 These wooden sculptures were made, believe it or not, with a chain saw! It did not start well. Actually, it started with an evil downpour of biblical proportions that left us all stranded under Maggie’s pavilion lost in the middle of the woods. I was not impressed then, but it got slightly better. First the weather changed completely and a totalitarian sun started shining, and we got the chance to set up our tent. Once it was done, we got the opportunity to get some great food at the volunteer buffet down by the main stage. The rain came back though, even more violent than before and I started wondering what the Hell I was doing there. As the evening progressed the rain ceased again, this time for good and we finished setting up camp. Night fell at the end of this July day which was very confusing for us northerners but we did put up with it and peacefully ended up in the arms of Morpheus.